Marketing Automation has been leveraged by large corporations ever since its existence. Early solutions were (and most still are) robust, feature rich, and consequently complex and expensive. This has made it hard for smaller companies to get started with marketing automation. Even if a small business can afford marketing automation software, they have a hard time implementing it and getting true value out of it. This phenomenon bothered me because small businesses with limited resources can really move the needle by using marketing automation. Leveraging automation can massively increase productivity and consequently revenue. Unfortunately, most current solutions are not really tailored for small business. So, as a marketer at an email marketing automation SaaS company, I felt like it was my duty to find out the things small business marketers have a hard time doing. I did just that by surveying more than 130 professionals working in marketing. My insights are being shared with the world in a roundup article and epic 55-page report backed by data. This article highlights the key findings and data of the report. Plus, I’ve hand-picked the best marketing automation advice provided by experts during my research. Let’s get to it. In my research, 90% of the respondents are from companies with 50 employees or less. This means that small and micro businesses are significantly over-represented. More than half of the respondents (57%) work at companies with 2-10 employees. A fifth (20%) of the answers came from companies with 11-50 employees. 17 submissions (13%) came from solopreneurs. The most submissions (38%) came from professionals working in Growth positions like Marketing and Sales. 31% of the respondents in our survey are business owners. A quarter of the participants (25%) are CEOs. These three groups make up 94% of the submissions. Marketing was the industry of 47% of the respondents. This was intentional as we collected the data so that about half of the respondents would be from the marketing industry. The Software Development industry came in second in the survey, with 25% of the submissions coming from this industry. All this juicy data is great, but you came here to read about marketing automation challenges, didn’t you? So let’s get to it! In our survey, 85% of respondents use some kind of marketing automation. The most common challenge people face with marketing automation is creating quality automations, with 16% of respondent mentioning it. Based on our data, integrations (14%) are another critical challenge users face with marketing automation technology. Marketing automation requires lots of content. No wonder then, that creating content came in third place, with 10%. Engagement (8%) is another major challenge and is closely related to content. Automation requires top-notch quality content to drive engagement. Segmentation, data management, and optimization are mentioned by 6% of the participants as a marketing automation challenge. Finding tools (5%), personalization (5%), lead scoring (5%), analytics (4%), reporting (3%), and deliverability (1%) were all mentioned as a challenge by some of the surveyed professionals. Coming up, we’re going to take a look at how these challenges differ between two industries: Marketing & Advertising and Software Development companies. The main challenge of the marketing & advertising industry is integrations (25%), with a quarter of the participants mentioning it. Even with all the integrations provided by marketing automation vendors and solutions like Zapier, it’s still challenging to set up integrations between different platforms and tools. Creating automations (21%) came in second place which, depending on the platform, can be a real challenge for lots of marketers. Engagement and creating content (15%) are tied as the third most significant challenge companies in the marketing & advertising industry face with marketing automation. Personalization and optimization (9%) are also neck and neck for the fourth place in the marketing & advertising industry challenges. Finding tools (8%) is mentioned significantly less by companies in the marketing & advertising. Segmentation and data management (8%) are similar in this regard. Both of them are mentioned by 8% of marketing & advertising industry professionals. Analytics and lead scoring (6%) seems to be a challenge for some companies in this industry. Reporting (4%) and deliverability (2%) were mentioned by only a handful of companies in the industry as a challenge. For Software Development companies, the most significant challenge, by far, is creating automations, with 27% of respondents mentioning it. Generally, these companies require more sophisticated automation for client acquisition, user onboarding, and retention. Creating content (18%) came in second place, which is considerably higher than in the other industry mentioned before. The reason behind this may be is that smaller companies in this field first focus on hiring developers rather than marketers or copywriters. This causes some resource issues for the marketing department. Integrations and complexity are both major challenges that companies in the software development industry face, with 15% of respondents mentioning them. Engagement, data management, segmentation, and optimization were all mentioned by 9% of respondents working at software development companies. Lead scoring (6%) and analytics (3%) were only mentioned by just a few companies of the industry. So these are the marketing automation challenges of marketing & software development companies. 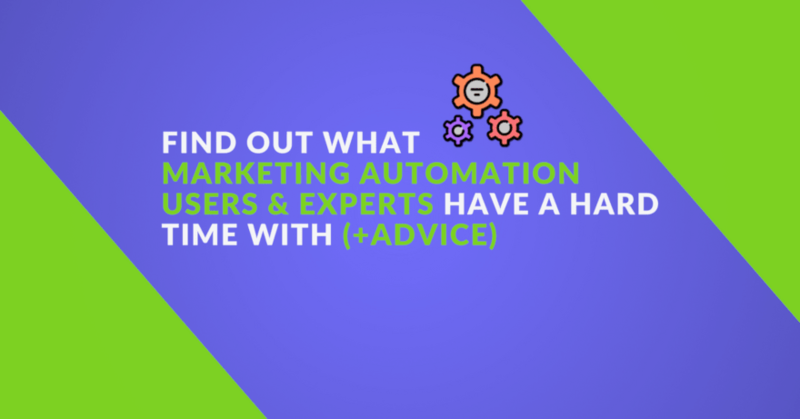 Some of the respondents in the survey were kind enough to provide some advice for people starting out in the world of marketing automation. Let’s hear them! If some of these challenges ring true to you, feel free to reach out to me and I’m sure we’ll find a way to ease your pain. Until then, stay awesome! Great Post, Marketing is not a rocket science theory anymore. A true automation helps the organization to grow more. Nowadays there are lots of Automation solution provider available in the market with niche categories. If you wanted to grow more then just adapt Automation. Exactly, I totally agree. New, easy-to-use solutions make it easier for marketers to get started with automation and help their company grow. Great article! Well in my prospective company which has a huge amount of employees they usually grow their business from clients and this is the toughest goal of all time the relly on clients too much but if you think out of the box you can earn without creating leads! in short-term make I product that is unique and cost-effective. Yes, actually dealing with people takes time. But it is also why clients become loyal to a brand and buy more often. Those who avoid interacting with their customers rarely get repeat sales (which is their typical excuse for not interacting with the one-off customers they have). This marketing automation advice helps a lot. As we know marketing is the essential part of the Business. your vision is really great. Thank you so much for the kind words, glad you like it. (: It sure is! Yes, but hopefully technological advances will democratize the market, so smaller players can have their piece of the pie too. We’ll see. Thank you for the information about “Marketing Automation” This is my new knowledge. Marketing is an essential part for the growth of an organization. You explained the process very well and gifs are also superb. Marketing Automation is the best solution when it comes to the accuracy of a targetted audience to market. For a small company it can be implemented with least cost but large companies it will be higher cost and will the accuracy remain the same is my question. It is, although I’m not a 100% sure I understand what you’re trying to get across. Do you mean that it’s harder for large companies to send targeted messages? Marketing automation is a beautiful struggle. The difficulty of using it makes it worth it once you get to implement it and utilize it for your business. And that’s why I think there is a huge demand for marketers that are adept in using marketing automation software. At the same time, small businesses can’t afford hiring these experienced marketers therefore making it hard for them to fully utilize it. It sure is! However, I don’t think we should accept the fact that it’s difficult to use marketing automation. We definitely don’t accept it at Automizy, we’re all about making it easier and more intuitive to implement and use marketing automation even for novice marketers. I think new solutions with better UX will change this trend in the upcoming years. Well! I think smaller companies are having hard time due to their client limitation and budget issue, but clients with the big budget will going to get relevant rankings through out the globe. Partly true, but as marketing technology advances cheaper solutions are appearing, so budget shouldn’t be a huge issue. I think small companies are having hard time in marketing automation than big companies. Thanks for your comment! (: Yes, that might be a possible reason. Although we’ll have to dig really deep to find the exact root causes. Then again, those are probably different for every company. Btw, what’s your personal experience about the topic? Creating marketing automation isn’t just a science but an art. Simplicity is the key here. Absolutely, you hit the nail right on the head.